A neuroma is a benign enlargement of the nerve. A neuroma is not cancerous and is not a true tumour, but a reactive, degenerative process such as a scar. It most frequently involves the nerve that supplies sensation to adjacent sides of the third and fourth toes, but can also affect other toes of the foot. As the nerve becomes irritated, the nerve gets larger and causes sharp pain, cramping, burning and sometimes numbness. Symptoms are often aggravated by walking in shoes and relieved by removing your footwear, resting and massaging the area. Pain that occurs at rest may be an indication that your condition is getting worse. Although the exact cause is unclear, several factors contribute to its occurrence. High-heeled shoes, trauma, inflammatory conditions such as arthritis and repetitive trauma from stresses incurred in recreational activities are several factors. 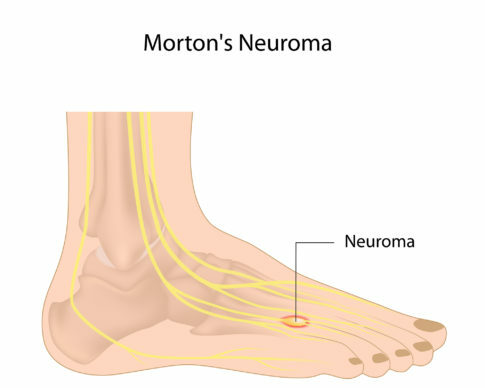 Any condition that causes constriction of the nerve can lead to the development of a neuroma. Your symptoms can often be reproduced upon physical examination. After an evaluation by Dr. Chaudhry, a treatment plan can be made. Conservative treatment may include shoe modifications, custom orthotics, cortisone injections and perineural injection treatments. The decision to surgically intervene will be based on your symptoms and your response to conservative treatment.